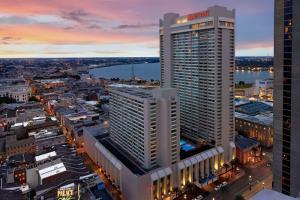 The Marriott New Orleans is located in the French Quarter just steps from Bourbon Street, the Convention Center, downtown business district and iconic Big Easy attractions. The hotel features more than 1,300 well-appointed guest rooms and suites with contemporary decor, spacious work areas, in-room refrigerators and coffee-makers and Wi-Fi. The hotel also features an outdoor pool, a fully equipped fitness center, and an updated Concierge Lounge. Located in the French Quarter, 14 miles from the Louis Armstrong International Airport. 5 Fifty 5, 55 Fahrenheit. Audubon Insectarium, Jackson Square, St. Louis Cathedral, Longue Vue House & Gardens, Louisiana Children's Museum, New Orleans Museum Of Art.